Nothing is more unsettling than a baby who won’t sleep. It doesn’t matter if you have an early morning job or if you stay at home with your little one, not being able to sleep at night can be maddening. Especially if your baby is fussy on top of sleepless! Your head just hits the pillow as your precious little bundle of joy lets out yet another scream for the umpteenth night in a row. And suddenly you feel like you won’t be able to cope with life one more day if you can’t get at least an ounce of sleep. So what do you do when your baby won’t sleep? If you’re like most moms, you probably run to Doctor Google and start frantically searching for ways to get your baby to sleep. At this point you’ll do just about anything for a night of rest. At this point, you’d even take a couple of hours. That’s totally understandable! Insomnia can cause Insanity! Undoubtedly, you will run into a method of sleep training called cry it out. Maybe you’ve even heard of it before but brushed it aside because you couldn’t imagine you would ever use it. There are many variations of sleep training, but when broken down it’s simply putting your baby in his crib after he has been fed and changed and all his needs have been taken care of. Then the baby is left to fall asleep on his own. It might involve the cry it out method where he will cry until he finally gives up and succumbs to sleep. Whatever the case, sleep training means he has to learn how to fall asleep on his own. Simple enough, right. In fact, when the screaming baby finally stops crying, you should feel nice and peaceful and able to sleep. Right? But what if there’s a part of you left wondering if this is the best thing for the baby? Maybe you’re left with more questions than answers. Should you sleep train your baby? 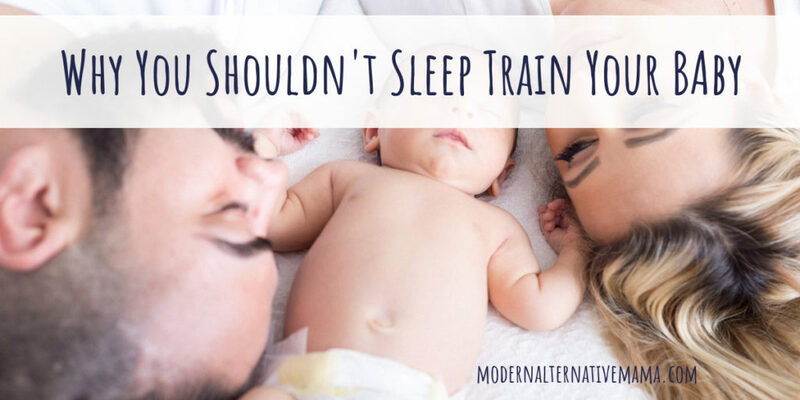 I’m here to tell you why you shouldn’t sleep train your baby. Let’s explore some of the reasons why it isn’t a good option for you or your baby. It seems like getting your baby to sleep on his own would naturally cause less stress for you. But hearing your baby cry on end for hours (sometimes) at a time can be very stressful. In fact, instead of producing a relaxed environment, it can actually cause you to feel more stressed. Letting your baby lie unattended in his bed to cry it out on his own goes against the natural intuition of a mom. You are your baby’s life-giving provider and not helping him to sleep, hould cause you to feel stressed. 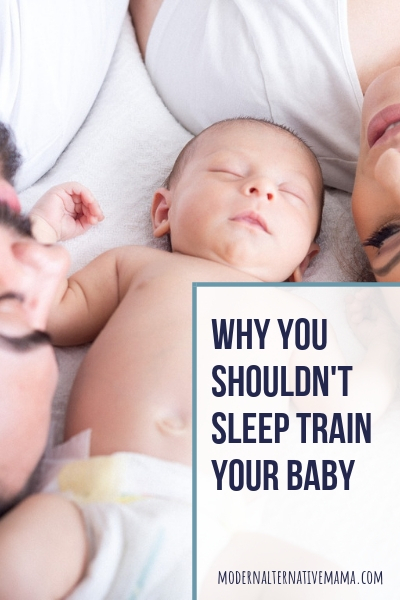 Advocates of sleep training will tell you that getting your child on a schedule and sleep training your baby will make your household feel more under control, and it is true that once your baby begins to sleep you will feel more settled. But if you have to let your baby cry for hours and hours before you can achieve that goal, then you better believe, you will feel stressed. Your baby will also feel the stress of having to comfort himself. He has no idea why he has been placed in a room by himself, crying and alone. He may feel scared, alone, and uncertain. He may feel like his needs are unmet, and he will definitely feel stressed. Babies are little and their brains are still developing. Human interaction is a part of that development. Leaving your baby in a room by himself may essentially hinder his development. Much of your baby’s development happens during sleep and if your baby is fitfully getting himself to sleep, then there’s a chance his development could be impaired. During babyhood, babies need love, reassurance, and comfort (among other things.) Think about it for a moment. If you are uncertain of your surroundings, would sitting in a room all by yourself with no one calming your fears make you feel trusting and secure? Imagine the person you trust the most, telling you you’re going to be fine, and to buck up. Basically, that’s what you are telling your baby when you leave him in a room by himself to learn how to sleep on his own. Does “Crying it Out” Actually Mean the Baby Gives Up? If nothing else convinces you why you shouldn’t sleep train your baby, then maybe this article will. Please take the time to read it. It’s well worth it. In it, the author discusses the silence noted in overseas orphanages. Essentially, the babies are silent and have given up because they’ve realized that no one is going to come to their rescue anyway. They don’t bother with crying because it doesn’t work. It doesn’t mean their needs have been met; they have not. Crying is pointless to them. Could it be, that when a baby is sleep trained, he is feeling much the same thing? Has he discovered that frantically crying for his parents is a futile attempt and it’s not worth trying at all? This reason alone, is reason enough not to sleep train your baby. If you are a mom, then your job is to help your baby. Period. The unfortunate truth is part of that responsibility means sleeplessness and exhaustion. But your baby will learn to trust you as you help him learn how to sleep. Please don’t make your baby navigate the first part of his life on his own, in exchange for a quiet night of sleep. Help him to understand that sleep is a good thing and help him to develop healthy habits surrounding sleep. Sleep training is not natural. Your baby spent almost a year of his life inside of you with your comfort, warmth, and very heartbeat helping lull him to sleep. To take him away from that comfort and separate him from you, the one he trusts, and teach him to sleep on his own is not natural at all. If you are breastfeeding you may be in danger of interrupting the breastfeeding cycle if you sleep train. You risk losing your milk supply if you aren’t careful. When babies are little they’re meant to nurse around the clock, which means you will have to be an active participant in feeding your baby. You can’t do that if your baby is trained to sleep away from you for long periods of time. I know how hard it is to raise babies. I have seven kids ranging in age from one to 17 years old. That means I have experienced many, many, sleepless nights. There were nights when I never thought I would sleep again. In fact, there are still nights that I’m not sure I will ever sleep again! But I can tell you beyond a shadow of a doubt that it will be easier to help your baby sleep when he is older. Once your baby is old enough to talk to and rationalize with, it’s much easier to calmly explain to him that night time is a time for sleeping and he needs to rest. You will be able to take a gentle approach to helping your baby sleep. It’s much easier to use rewards and rationale with an older child than it is to with a crying baby who can’t understand what’s going on, in a room by himself unattended. Hang in there, mama! There will be a day when your baby sleeps, and you, along with him! Until then, snuggle up and enjoy the baby days! They don’t last forever! If you should decide that you need some method to help your baby get to sleep, please check out this gentle way to get your baby to sleep. How do you feel about sleep training? Do you have reasons why you shouldn’t sleep train your baby? Do you feel confused or concerned? Fully agreed! Thank you so much Amber for making this article, even though i am a new mother, i can never let my baby just.. “cry it out”.. the thought of it is just heartbreaking.. i understand we may need a break sometimes but regardless, if our baby is crying for that long, they are stressed and why do we want our child stressing that young.. I am so glad i finally read an article about this because this is not normal way of thinking!